On September 18, 2012, the Federal Bureau of Investigation made a new compilation to the Top Ten Art Crimes list. The piece of art is an oil painting by the French Impressionist Pierre Auguste Renoir and has an estimated value of $1 million. 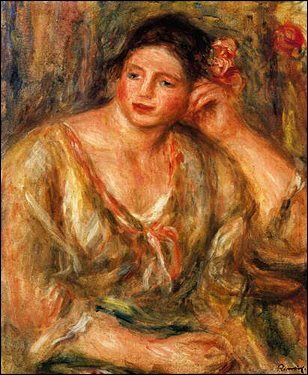 According to the FBI report, the painting, called Madeleine Leaning on Her Elbow with Flowers in Her Hair, was stolen in an armed robbery on September 8, 2011. Since the initial investigation, the FBI has now raised the award to $50,000 for any information that leads to recovery of the painting. The owner of the painting reported a loud noise downstairs on the night of the robbery, and after she checked on the noise, she was met by a man in a ski mask. Since the robbery, the FBI has alerted art dealers, gallery owners, and auction houses to look out for the painting. The painting is on a piece of canvas about the size of 50.17 x 41.28 centimeters. The painting is no longer in its original frame. The victim reported that the masked robber was about 18 to 26 years old and white. He was also about 160 pounds and 5’ 10” tall. The man owns or had possession of a large-caliber handgun. Contact the FBI if you have any information. You should contact your FBI office or the U.S. Embassy or Consulate near you. You can also submit a tip at www.fbi.gov. Since the Top Ten Art Crimes list was established in 2005, six paintings and one sculpture have been retrieved by the FBI.